I have been working on a octagon house plan. Is it possible to build an octagon with earthbags any larger than a circular plan with earthbags? The building location will be in SE Utah where there is already an earthbag building (blm station). Of all the designs I have seen this one makes the most sense for my husband and I. I was wondering if the bathtub could be increased in size for a two person tub/shower and if the design can pass the tough hurricane standards. Also, since we are in Florida, a southern bank of windows does not work. Would we be better off having the windows facing north or east? I would also like to know if any of these earthbag homes have been built here in Florida. Thanks! Precision Structural Engineering, Inc. http://structure1.com/index.htm will approve the plans and design it for hurricanes and codes in Florida. Contact them for a quote on the engineering. There’s not much extra room in the bathroom for a larger tub, as you can see in the drawing. How much bigger do you want? It’s easy to adjust the windows and/or change the orientation to prevent overheating. Most clients don’t tell me where they live, so I can’t say for sure if any of these roundhouses have been built in Florida. There are none to my knowledge. Owen, This will be the first time I will be building a home. We are currently purchasing the land. Can you tell me what steps I need to take next? What information will I need to approach the county building department with for a permit? I’d like to find out if i can do this before spending much money. Any information you can share is most appreciated. Thanks! For sure, don’t spend money until you get all the details clarified. Ask for a packet of information and study everything carefully. Some places make it almost impossible to build low cost houses with alternative building methods. Where do I find the free AutoCAD drawings? I looked on Dream Green Homes and did not find it. Can you give me the link? Also do you have the mirror image of this anywhere on the net? The mirror image has much better feng shui. There are only a few free plans at this time: straw bale shelter, solar pit house, economizer and a few others. Email me if you want one of them. 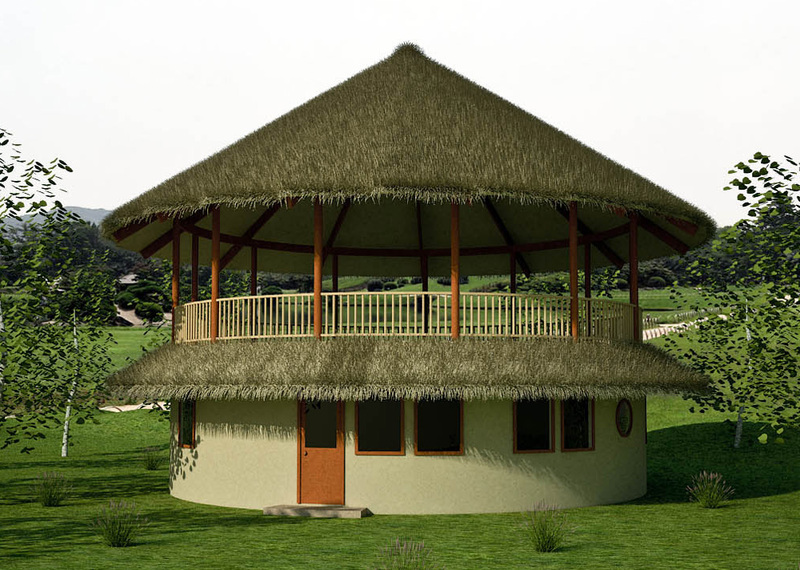 Could this size roundhouse be 2 story? Yes. Earthbags have 10x the compressive strength of wood stud walls. But it’s best to use lightweight building methods on the 2nd story because it’s difficult to move lots of heavy material high off the ground (or get a tractor, etc.). hello my name is michael and ive come across 5 acres of land in oklahoma and my wife and i intend to build an earth bag home on it.my question is can you send us a list of your free plans as we believe one of your plans for a small structure would be great as a starter building to learn with. we would like just a list so we could pick one and ask for plans. we are not looking for all your free plans we would just like a list so we could choose one. Hi Owen ! I bought your book( it’s awesome) & would like to start building the simple studio you have on the cover in a month to begin with so I can live in it but would like to build an outside deck above to hang hammocks for when my friends stay over ( it’s in nicaragua so can sleep outside) would that take much more time to build ? & can you sell me some plans for that or tell me how to go about it ? Buy the Studio plan and then show the drawings above to a local builder and they can figure out how to add the deck on your studio. I see that this is the maximum size circular building you can build without buttressing. 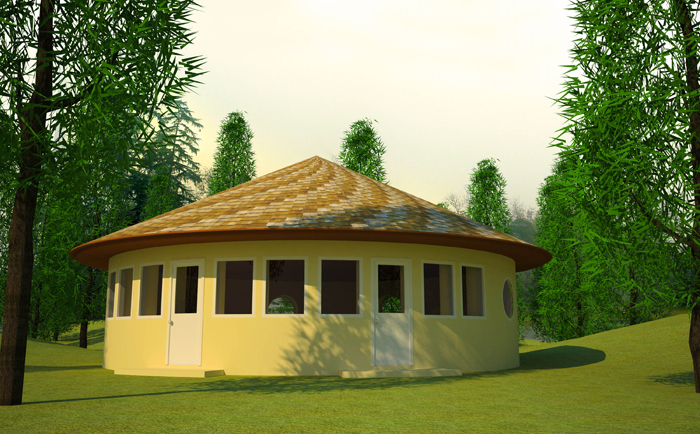 I plan to build a 24′ diameter circle with a central, heavy timber pole to support the roof rafters, similar to a yurt, and backfill with soil against the walls. Do you have any ideas about berming an earthbag structure this large without interior buttresses? Thanks! Use 24″ wide earthbags, internal rebar pinning about every 2′, and 2-3 layers of strong plastic sheeting to keep water out. I add one sheet that angles out to help divert water. 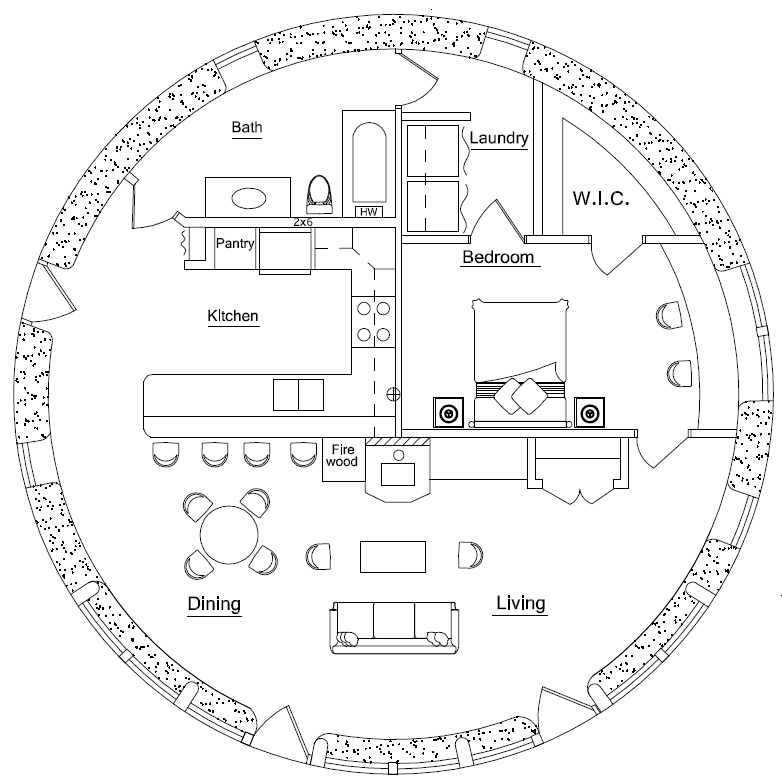 Would love to get blueprints of the 33′ round house both with upper level thank you. Will pay what ever it costs. Thank you again!! !